So another few days of commemoration and celebration in the name of Vice Admiral Lord Cuthbert Collingwood, this time on the Mediterranean island of Menorca and close to where, on 7th March 1810, the great man breathed his last. 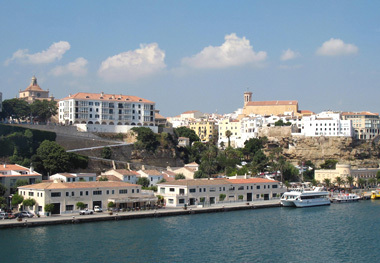 The waterfront at Port Mahón. In many ways, the events were similar to those that had taken place in Morpeth and on Tyneside a few weeks before – the Royal Navy were there, there were civic receptions, commemorative events and celebrations – but these all had a clear Menorcan flavour about them. 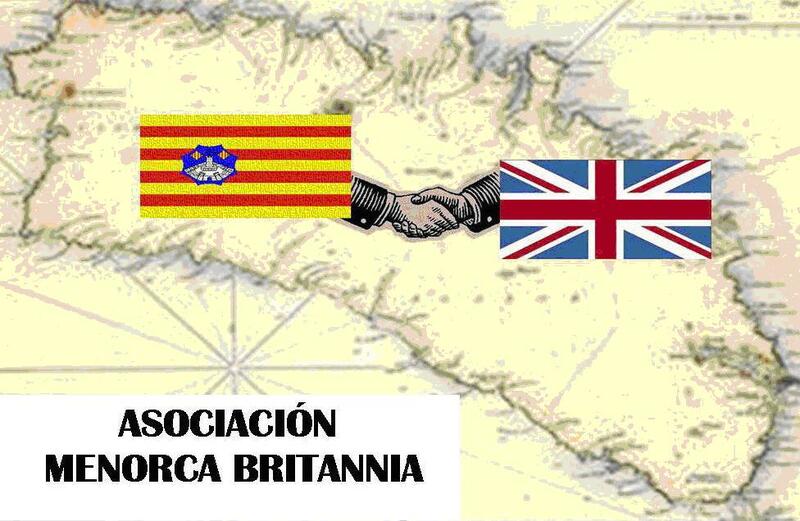 The programme was superbly organised by a small team from the Asociación Menorca Britannia, who did a marvellous job of coordinating with the Royal Navy, local authorities and officials, sponsoring companies and other organisations on the island. 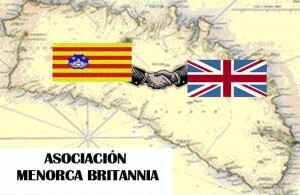 As its name suggests, the Association exists to promote understanding and relations between the British community on the island and the local Menorcan population. Indeed, the degree of interest in the Collingwood event amongst the Menorcans was evident in the numbers who turned up to the various public events and in no small measure due to the excellent promotional work done in the last few months by the small and dedicated organising committee within the Asociación Menorca Britannia. 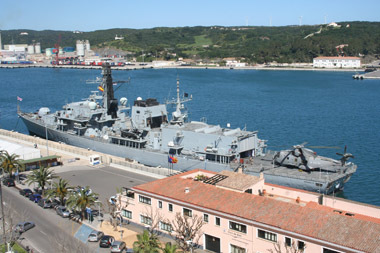 HMS Monmouth alongside at Port Mahón. In the same way that Tyneside had welcomed HMS Cumberland, Menorca welcomed HMS Monmouth, this ship returning home after a tour of anti-piracy duty off East Africa. The short stop-over in Port Mahón allowed the officers and crew to enjoy some much deserved R&R, as well as providing a significant and greatly appreciated presence in the official ceremonies to mark the anniversary of Collingwood’s death in local waters just over 200 years ago. 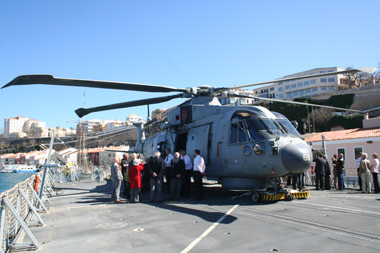 There was considerable local interest in the ship and a series of both private and public tours of the ship were arranged, with an estimated 2,000 visitors given the opportunity to see around the ship, a high percentage of them being local Menorcans – in fact a very high number, given the fact that the ship’s open day coincided with Palm Sunday. Bryce Lyons, of the Asociación Menorca Britannia, reads a translation of a letter from Collingwood to his wife and daughters to the reception held by the Consell Insular. On Saturday 27th March, the Island Council (Consell Insular) hosted an official reception, bringing together visiting VIP’s, Officers from HMS Monmouth, representatives from the British Community on Menorca and local officials. 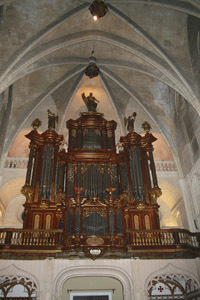 The magnificant organ in the Church of Santa Maria. Later that same evening, an organ recital took place in the Church of Santa Maria by Tomé Olives – the particular significance here being that the organ has historical links with Collingwood. The new organ for the church was commissioned by a local merchant in 1809 and an impressive wooden housing was ordered from Austria. This housing was transported overland to the Italian coast, but no merchant ship could be found that was prepared to take its chances with the French fleet lying in Toulon. Collingwood heard of the story and despatched a frigate to collect the housing and likewise ensured that the organ itself was escorted to the island. The installation of the huge and magnificant instrument (it has four keyboards and 3006 pipes) was completed and it was first played in 1810 – which also makes this year the 200th anniversary of the organ. A team from HMS Monmouth also took on the local (mainly ex-pat) rugby club, soundly thrashing them by 27-0. 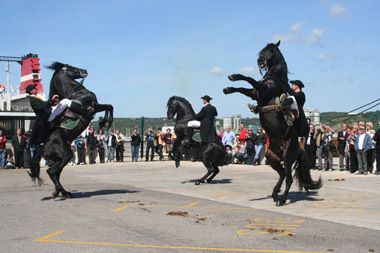 The magnificant Raca Menorquin horses entertain. Sunday’s activities commenced with a craft market on the quayside near the ship. A demonstration of the famous Raca Menorquin horses by the Equimar team then took place bringing out a sizeable and appreciative crowd. 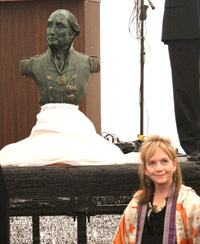 Sculptor Helen Ridehalgh stands besides her bronze bust of Admiral Collingwood at the official unveilling ceremony. The official unveilling of a bronze bust of Collingwood, specially created by English sculptor Helen Ridehalgh, then took place. 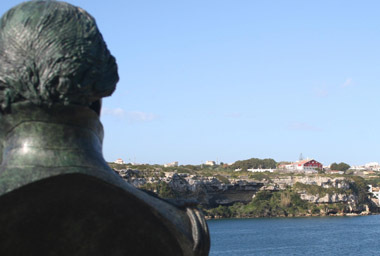 As the final location of the bust was to be on King’s Island (Isla del Rey) in Mahón harbour, it had been arranged to display it at a larger public ceremony first on Mahón quayside. HMS Monmouth provided an extremely smart honour guard and the unveiling was performed by Captain Frederick Price MBE, PhD, the Defence Attache at the British Embassy in Madrid, who addressed the crowd in both Spanish and English, greatly impressing the locals! Another colourful demonstration then took place, this time by the local music and folk dancing group Es Rebost, who featured within their line-up some real youngsters! 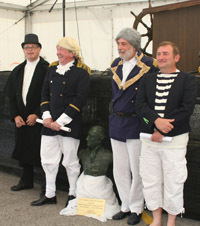 The Charity Players pose beside the Collingwood statuette. This was followed by the debut performance of a short play, performed by the Charity Players, a local amateur English theatre group. It was written by Bryce Lyons of the Asociación Menorca Britannia and set on the Ville de Paris as it carried the recently deceased Admiral’s body towards Gibraltar. 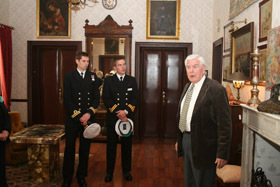 Sr. Francisco Pons Mantonari telling two young officers from HMS Monmouth about the Collingwood House ghost. For a very fortunate and specially invited few, there then followed a real treat – a private tour of ‘El Fonduco’ – the Hotel del Almirante (Collingwood House), courtesy of the family Mantonari. Although not yet open for the season, the House oozed charm and history, brought alive by the practised rhetoric of its owner and guide. The hotel will have a new feature for this year – guests will be able to look across the narrows to the Isla del Rey and see the House’s one-time resident (or at least the bronze bust of him) looking back. The staff told us they have always had binoculars on hand for looking at the ships, but are now considering installing a telescope, permanently angled towards the island. Up at the local Son Parc golf club, a team from HMS Monmouth were losing to a member’s team, levelling up the sporting challenges, while on the ship, the remaining officers and crew were again preparing to welcome people on board, this time for a ‘Capability Demonstration’, with areas of the ship’s operational equipment on display. As the sun went down, HMS Monmouth again turned out a sports team, this time to take on a team from the local league side, San Lluis F.C. Battling both a cool, blustery night and a physically taxing artificial pitch, they lost by 6-0. 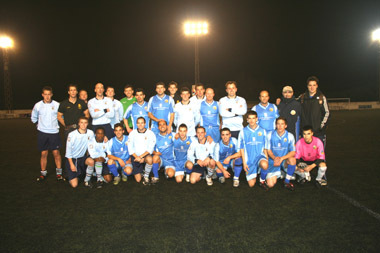 The San Lluis FC and HMS Monmouth teams after the game. The football game and golf tournament were each played for a special “Collingwood Trophy”. The golf club actually insisted the ship hold that trophy even though they had lost on the day, with the provision that they come back and challenge for it again, while San Lluis F.C. kept theirs, to be played for again by the next Royal Navy vessel to call in at Menorca. Developing friendships seemed to be a feature of many of the commemorative activities and the prospect of future meetings for ongoing sporting challenges were just one example. 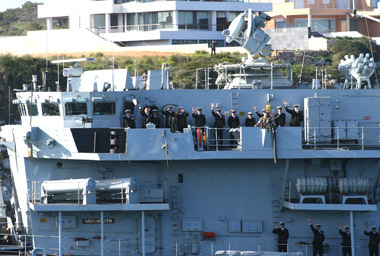 The officers and crew of HMS Monmouth wave goodbye as the ship departs. By Tuesday, the bronze bust of the Admiral had been properly installed on a fine white pedestal on the Isla del Rey, known to the British as Bloody Island on account of the military hospital that had been built there. HMS Monmouth departed mid-morning and, as she swept majestically through the narrow channel between the island and the south-western bank of Mahón harbour, her crew lined the ship’s side and were called to attention as they passed the headland. A sizeable crowd of both British and Menorcans had made the short journey across to the island for the ship’s departure and gave her a fitting send-off as she headed out to sea. The Admiral gazes on his one-time home. 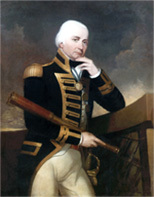 Helen Ridehalgh has actually modelled the Admiral looking slightly to his right and the bust has been so positioned that he is looking across the channel directly towards the Hotel Almirante – Collingwood House – the building he used as his shore quarters when in Port Mahón. Capt Stephen Healy tips a ceremonial spade of Menorcan soil onto the roots of one of the newly-planted English Oaks (Collingwood bust in the background). One official duty remained in the Menorca programme and this took place on the Wednesday. Trees Please Limited, a nursery in Corbridge, Northumberland, had kindly donated three local oak tree saplings to the Collingwood 2010 Festival and the City of Newcastle, the Borough of North Tyneside and the Town of Morpeth had between them paid for the three trees to be transported down to Menorca. They were to be planted in the names of the three places as a gesture of international goodwill from the people of the north-east of England to the people of Menorca and in recognition of Admiral Collingwood’s well-documented practise of sowing acorns to grow oak trees that would provide timber for future naval vessels. The idea was extremely well received by the Menorcan community in particular and the story was extensively covered in the local press. The three saplings were planted in a semi-circle around the Collingwood bust, such that (with luck and good care) in perhaps 50 years, the Admiral will rest in the shade of good English oaks. 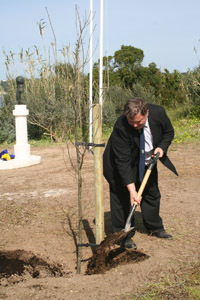 Captain Stephen Healy, representing the Collingwood 2010 Festival Committee performed the short official “planting” ceremony, marking the conclusion of Menorca’s commemorations. It is planned to landscape the area around the bust and the trees, laying down a formal path and creating an attractive memorial garden. An information board will also be installed, giving details (in both Spanish and English) about the Admiral, the bust and the oak trees. What a year Collingwood is having….